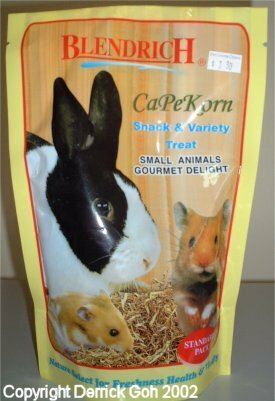 Many guinea pig treats are sold in Singapore. There's no way I can review every one of them but I shall feature some of them here. I have used some of these treats before so for those I'll be able to give my personal opinions. For the others, I'll just include some info. The treats have been grouped according to the manufacturers. Contains sunflower seed, wheat, whole corn, milo, peanuts, dehydrated alfalfa meal, soybean meal, soybean hulls, ground oats, corn gluten feed, sliced almonds, cashews, dehydrated tomatoes, dehydrated spinach, dehydrated celery, dehydrated onions and dehydrated red & green peppers amongst others. 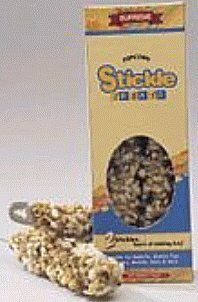 The nuts & corn are fattening however if given in small amounts & occasionally, I believe this treat is fine. Since it contains nuts, do be careful & make sure it doesn't go rancid. Minimum crude protein is 12.5%, minimum crude fat 7.5% & maximum crude fibre 8%. This product is enriched with 10 minerals, 13 vitamins & 18 amino acids. I know it sounds healthy with all those minerals & vitamins but remember, it is a treat & NOT a vitamin so as with all other treats, go easy & don't overfeed. 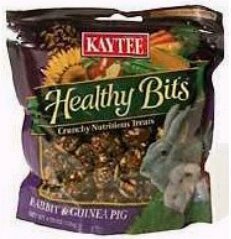 The good thing about this treat is that its 100% naturally preserved compared to Kaytee treats which all contain Ethoxyquin. 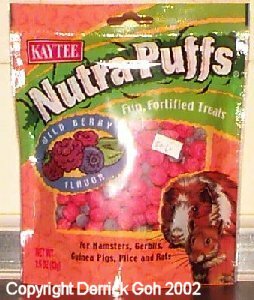 In fact some Kaytee treats even have not 1 but 2 artificial preservatives. 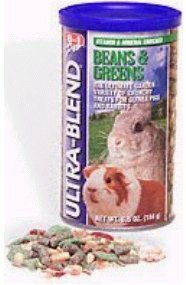 Ingredients include corn, dehydrated alfalfa meal, wheat middlings, green split peas, yellow split peas, dehydrated carrots, navy beans, celery flakes, soybean meal, soybean hulls, corn gluten feed, feeding oatmeal, pinto beans, red kidney beans, white rice, salt, animal fat (preserved with vitamin E and citric acid), ascorbic acid & artificial colours. Minimum crude protein is 14.5%, minimum crude fat 1.5% & maximum crude fibre 10%. Not a very suitable treat since it contains animal fat. Remember that cavies are vegetarian & any animal product should be avoided. 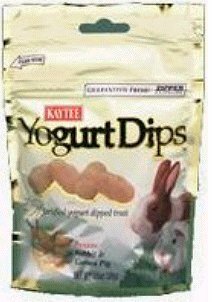 Yet another brand which sells yoghurt drops. 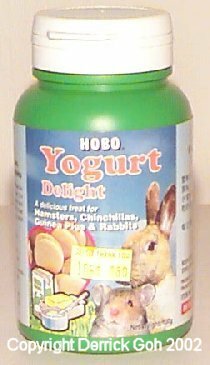 Besides 8 in 1, Vitakraft & Hobo also have yoghurt drops. 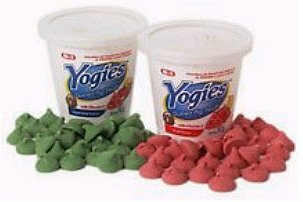 I guess the advantage of 8 in 1 & Hobo yoghurt drops is that they come in plastic containers unlike Vitakraft's which comes in a cardboard box & hence more likely to go mouldy. Think the furballs will have fun eating it while it spins! Comes in sweet corn & peanut butter flavours. Ingredients include oats, dehydrated alfalfa meal, cracked corn, milo, oat groats, sunflower hearts, peanuts, wheat, dehulled soybean meal, Canadian field peas, gelatin, dried papaya, dehydrated carrots, honey, dehydrated Apples, cane molasses, corn oil, dried whey, L-Ascorbyl-2-Polyphosphate, Yucca Schidigera extract, dried A. oryzae fermentation extract, dried Bacillus coagulans fermentation product, dried Bacillus licheniformis fermentation product & dried Bacillus subtilis fermentation product. Minimun crude protein is 16%, minimum crude fat 5% & maximum crude fibre 15%. Contains lots of fermentation extracts so I guess its good for the digestive system. However it does contain Ethoxyquin, as does all Kaytee products. Contains suncured alfalfa, ground oats, ground wheat, wheat germ meal, beta carotene, corn sugar, wheat flour, wheat middlings & dehulled soybean amongst other stuff. Minimun crude protein is 14%, minimum crude fat 1% & maximum crude fibre 35%. The berry version uses raspberry puree while the carrot one uses dehydrated carrots. The only thing bad is that it uses 2 preservatives namely Propionic acid & Ethoxyquin. Also has artificial colouring. But if given in small amounts once in a while, I guess it should be okay. 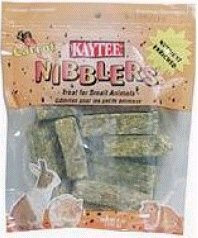 However I did find moths & maggots in the bag I bought so please be very careful when you buy this or any Kaytee consumables! Ingredients include rolled oats, wheat, white & red millet, milo, dried currents, oat groats, green split peas, dried pineapple, toasted corn flakes, red & golden raisins, dehydrated alfalfa meal, dehulled soybean meal, ground yellow corn, dried blueberries, dried cranberries, ground rice, honey, sugar, dried cherries & dehydrated raspberries. Minimum crude protein is 14.0%, minimum crude fat 3.0% & maximum crude fibre 10.0%. The preservative Ethoxyquin is used but like mentioned above, in small amounts it shouldn't cause much harm. It doesn't contain any seeds or nuts at all so there's no way it can choke. 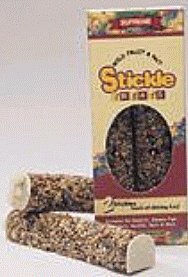 Having said that, it doesn't mean nut sticks are lethal to cavies. As long as the nuts are hulled (no shell) & are not too large, it should be fine. 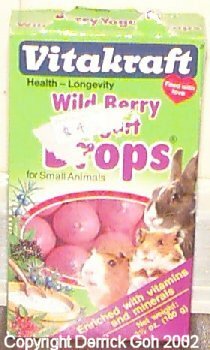 Comes in wild berry & garden vegetable flavours. In the ingredients list all I see are a bunch of scientific names. No wheat, corn, fruit, rice or anything like that. Guess its a very "artificial" snack. Contains 2 preservatives: Propionic acid & BHT. Minimum crude protein is 7.5%, minimum crude fat 0.5% & minimum crude fibre 2%. Crunchy nuggets with a fruit flavored yoghurt coating. Contains ground oats, soy hulls, soybean meal, ground wheat, dehydrated alfalfa meal, reduced lactose whey powder, dried non-fat yoghurt powder, etc. Uses artificial colouring. Minimum crude protein is 8%, minimum crude fat 15%, maximum crude fibre 10%, maximum calcium 0.5% & minimum ascorbic acid 150 mg/kg. Contains ground wheat, soy hulls, soybean meal, ground corn, soy oil, L-Ascorbyl-2-Polyphosphate (source of vitamin C), salt, Ethoxyquin (a preservative), artificial colours, etc. Minimum crude protein is 16%, minimum crude fat 4%, maximum crude fibre 14% & minimum ascorbic acid 1200 mg/kg. This snack is actually quite healthy having several vitamin supplements & is relatively low in fat compared to some other snacks. However it does contain Ethoxyquin which is supposedly one of the more harmful preservatives compared to other preservatives like BHT. Contains 68 different alpine herbs that supposedly aid digestion and natural well-being. 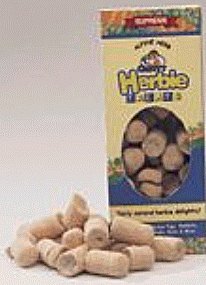 It has a crispy, crunchy carrot shell which is supposed to entice pets to gnaw and eat the beneficial herbs inside. Ingredients include popcorn, carrot, rice, peas & honey. 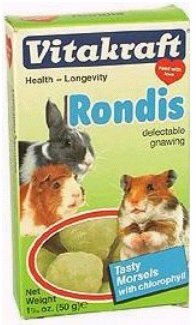 Contains raisins, carrots & apples. Contains juniper berries, rosehips, elder berries & peanuts. Comes in both natural & wild berry flavours. 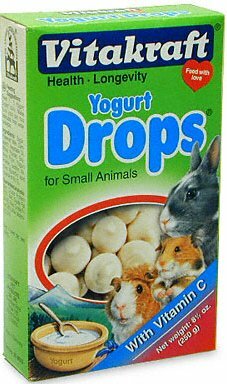 Similar treats include Orange Drops & Vegetable Drops however both don't contain yoghurt powder unlike the 2 featured here. I find storage a problem. In the open, it melts but the fridge isn't suitable either 'cos when taken out it melts too! 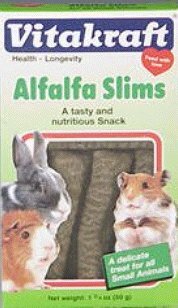 Probably most suited for people who have at least 6 cavies. This is 'cos they'll finish the drops before they get a chance to melt! 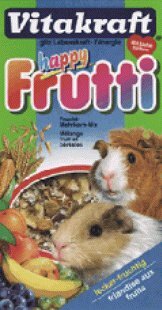 I remember I had to junk about 1/4 of the box 'cos it turned mouldy. I only have 3 cavies so they take time to finish it. Remember, NO OVER FEEDING treats!!! 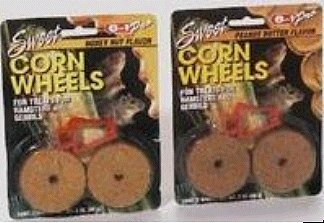 Ingredients include wheat, corn, soybean flakes & potato extract. Minimum crude protein is 12.5%, minimum crude fat 4.3%, maximum crude fibre 3.9% & minimum calcium 0.7%. 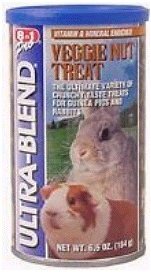 Ingredients include wheat, corn, wheat germ meal, carrots (dehydrate) & soybean splits. Minimum crude protein is 13.5%, minimum crude fat 3% & maximum crude fibre 4.4%. 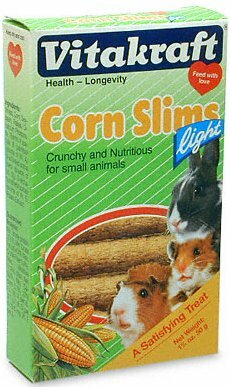 Nothing much to say 'cos its pretty similar to corn slims except for the flavour. Ingredients include wheat flour, corn grits, alfalfa meal, soybean meal & dehydrated carrots. Minimum crude protein is 13.1%, minimum crude fat 2.6% & maximum crude fibre 8.6%. 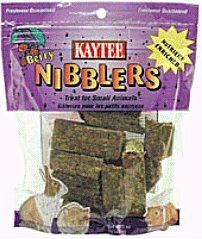 A good alternative to Kaytee alfalfa blocks or Kaytee Nibblers. 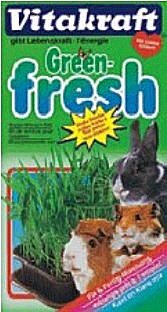 They may not be as hard & good for gnawing as the former but at least Vitakraft has a better reputation as far as freshness goes. 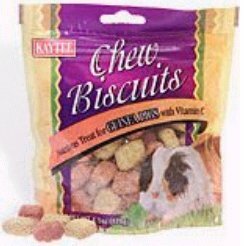 I have never encountered Vitakraft treats with maggots, weevils or any other gross things, which is more than I can say for Kaytee! A good alternative if you don't have a garden. However growing these may not be easy. Also you need to be careful not to feed too much especially initially. 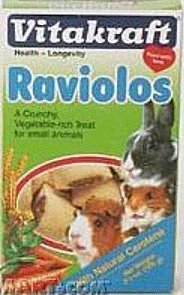 This is 'cos your cavies are probably used to a dry diet of hay & pellets, with the exception of some vegetables. So too much grass at one shot, could give them the runs! 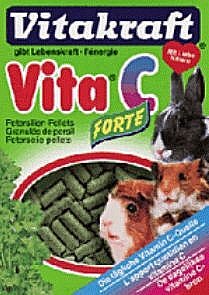 Made from parsley, these pellets contain lots of vitamin C. However if your cavies don't like parsley then it would be a waste. Parsley is also quite high in calcium so I wouldn't give these pellets too often for mature cavies. Besides it costs almost $5 for a tiny box, making it very costly to use as an everyday pellet. Probably more suitable to give them a handful per week. Vegetables inside grain based outer shells. 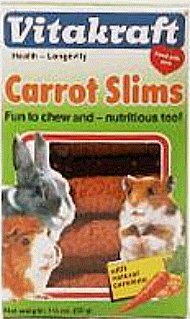 The carotene found in this snack is probably quite beneficial to cavies however that doesn't mean you can give them lots of this! After all it is just a treat. Some ingredients are wheat flour, corn flour, barley flour, salt, butter, syrup, kale & carrots. Minimum crude protein is 8.6%, minimum crude fat 4.1%, maximum crude fibre 1.5% & minimum calcium 0.06%. 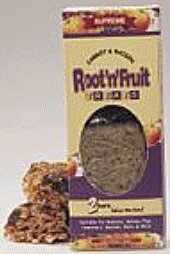 A mixture of exotic dried fruits. 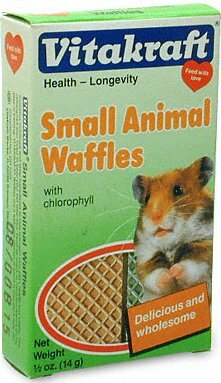 I don't know how, but Vitakraft claims the chlorophyll in these waffles helps keep your pet odour-free. Ingredients are wheat flour, soybean flour, soybean oil, lecithin, salt, sugar & magnesia. Minimum crude protein is 10.4%, minimum crude fat 3.9%, maximum crude fibre 0.7% & minimum calcium 0.06%. Not much is known about this yet 'cos I don't have time to go to a petshop to note down its info! Have also yet to find a website providing details about it. I will update this space as soon as I get info. All I know is that its some sort of biscuit which contains peanuts amongst other ingredients. Not much is known about this either for the same reasons as above. I will update this space as soon as I get info. For now all I know is that its some sort of puff or "cushion" & chlorophyll is one of the ingredients. Similar to Vitakraft yoghurt drops except it comes in only one flavour. 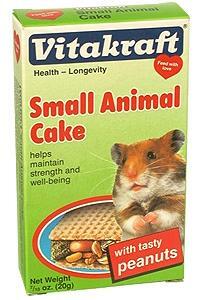 Comes in an airtight plastic bottle which is better than Vitakraft's cardboard box 'cos its less likely to turn mouldy. Contains milk, derivatives of milk, cerals, sugar, vegetable extracts, vitamins & minerals. Protein is 8%, grease 27%, fibre 0.2% & minerals 2%. Consists solely of dried locust beans. No other info is provided. Smells pretty fragrant & looks like dried pods (those that fall off trees) that have been broken into bite size pieces.